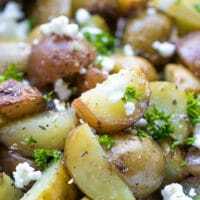 Grilled Greek Potatoes In Foil - quick and very easy to make, these potatoes are tender, flavorful and delicious. Seasoned with oregano, garlic, lemon juice and topped with crumbled feta. Preheat gas grill to medium-high heat (450-500 F). Cut 2 large pieces of foil (10x15-inches approximately). Wash and cut potatoes, pat dry with paper towel. Place in a bowl and add salt, pepper, oregano, garlic powder and oil. Toss to evenly coat potatoes in the seasoning. Divide between both sheets. Wrap tightly. Grill for 30-35 minutes. Check for doneness, if potatoes appear undercooked, cook for additional 5-10 minutes. Remove from the grill and meat them cool for 5 minutes. Open the packets and drizzle lemon juice. Top with feta and parsley. Enjoy!